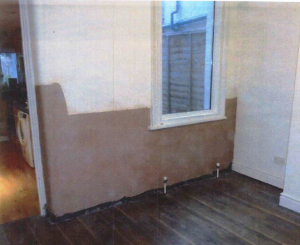 Following our clients purchase of a property in Waltham Forest Kenwood were called to treat rising damp. Treatment was required to the front bay and the rear wall of the reception room. Treatment was also required within the kitchen area. Due to the step down into the kitchen area Kenwood have tanked this wall too.